"I've put 17 of my products into the "SDK Clearance Bin"......up to 75% off. The sale will end Saturday, June 7th, and after that these 17 products will be gone, gone, gone!! I've just had a quick look and WOW...Herald has some great bargains, don't miss out hop on over to the store NOW! May Supa Digi Kit will be removed at the end of the week to make way for the June Supa Digi Kit, so make sure you get all of May NOW! SDK is up and running again, thank you to everyone for your support. I was hoping the site transfer would not be a big thing but apparently it is :( so the site is still down for maintenance. We are so sorry for the inconvenience. As some of you will know SDK experienced issues with their old Web Host. This prompted a move to a new Web Host who are great and very supportive. Unfortunately a lot of our American Customers experienced issues when downloading, files either timed out or took forever to download. This issue was investigated throughly but no cause could be found, so we are moving servers. Hopefully SDK will be up and running again soon, trouble fee. Thank you for your support while we get things back on track. Be sure to stop by Kristi's shop at SDK and check out these wonderful new products! Sew Raggedy kit! This kit of 10 papers and a variety of great elements including Raggedy Ann and Andy is sure to make any girls layout special! Be sure to pick up the Sew Raggedy AddOn for additional elements to this adorable kit! Here is an Out of this World kit perfect for the little man in your life! This kit comes complete with items in both color and grey scale for you to customize to fit your own personal needs! Suitable for personal and commercial use and scrap 4 hire! Along with the kit is an Out of this World Freebie Paper and Overlay Pack! This freebie comes with 7 premade backgrounds in both color and grey scale and coordinates perfectly with the Out of this World kit! The end of another school year is upon us which means lots of graduations to come! Be sure to head on over to Ellen's shop at SDK and pick up her new kit Graduation Memories to help you scrap this great acheivement! Graduation Memories contains 10 papers and 39 elements including a yearbook, prom ticket stub, tassels, and more! 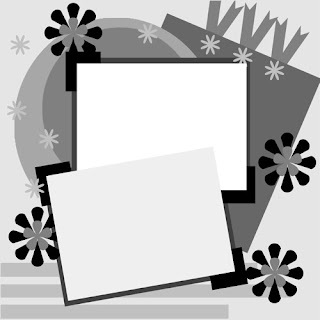 Graduation Memories Addon Kit contains an additional 5 papers and 17 elements to give you more options for creating uniques layouts for all your graduate layouts! Don't forget to join us in the SDK chat room on Tuesday, May 19th at 3:30pm EST/8:30pm GMT for our weekly chat! Cen is offering this little bonus for all who attend! 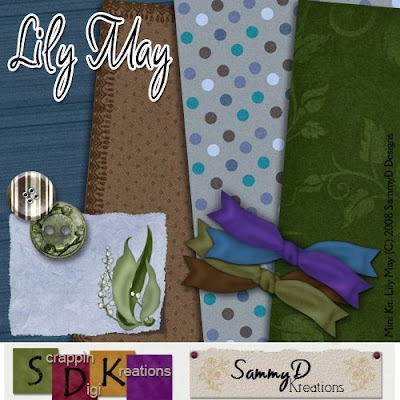 Stop by our On The House section at SDK to pick up these newest additions to this month's Lily May Supa Digi Kit! Check Out These Fabulous New Products! New products are arriving in SDK shop daily! Be sure to check out these and all of the other fabulous new products now available! As most of you know, SDK was down during National Scrapbooking Day. To make up for this, Kim is celebrating Un-NSD by offering all of her products for an amazing 50% off until the end of May! Hurry on over to her shop and snag these great deals before they're gone! And while you're there, be sure to check out this new addition to her French Collection series! 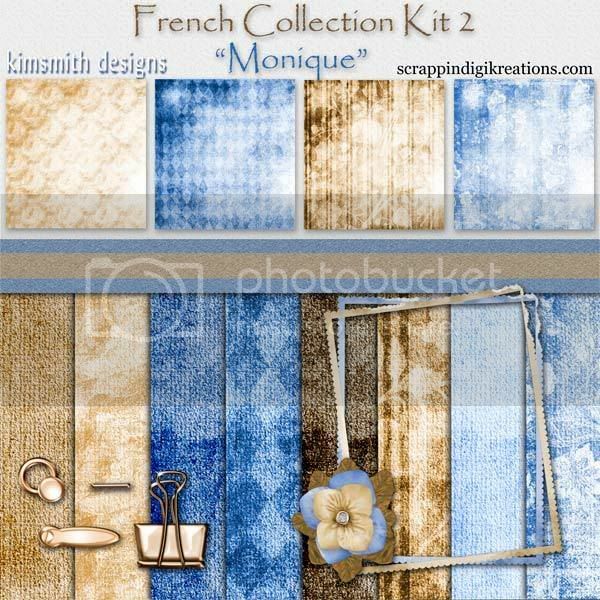 Monique contains 8 papers of solid and shabby textures and 8 elements in shades of French blue, brown, and tan. Perfect for a variety of great layouts! Herald is offering some free background papers on her blog that coordinate with her new Enchanted Garden kit. Be sure to stop by for a visit and pick them up! Janeal has this beautiful template freebie available on her blog which is available in 12 x 12 and 8.5 x 11 sizes! Head on over to Kristi's blog to pick up this adorable quickpage freebie from her Noah and the Arc kit! Spring is in the air over at SDK so stop by and check out these and other wonderful springtime kits in our shop! Brighten up any layout with this great Sunflower kit from Filly! 20 papers and 22 elements including gemstones, ribbon, and more is sure to bring a little sunshine to any layout! Beautiful Lilac by Adriana is a small kit that packs a punch! This kit of 7 papers and 29 elements in shades of purple and pink provides enough supplies for a ton of great springtime layouts! Botanical Garden from Lynn is a HUGE mega kit in every sense of the word! This kit comes with 28 papers and a whopping 100 elements including birds, flowers, and everything spring! From gardening to Mother's Day, this kit is perfect for a wide variety of layouts! Check out this great new Enchanted Garden collection from Herald! Enchanted Garden Paper Pack comes with 30 garden inspired papers which include cute teddy bears, beautiful butterflies, and more! Enchanted Garden Element Pack comes with 42 elements including bears, butterflies, flowers, and other great girly things! Enchanted Garden Alpha Set 1 with insect accents is perfect for boys while the garden accented Enchanted Garden Alpha Set 2 is perfect for girls! Check out these and other fabulous kits in our SDK shop! Looking for a great animal kit? Then look no further than SDK! The ladies have created some adorable kits sure to bring out the animal in you! The Bears and the Bees by Kristi is sure to bring a smile to your face. This adorable kit comes with 17 and 39 elements perfect for the bear lover in all of you. Noah and the Arc, also by Kristi, is perfect for every age! This bright and cheery kit with 10 papers and and elements including zebras, elephants, and, of course, Noah is perfect for a variety of layouts! Start scrapping those down home memories with this great new collection from Cathy! Ewe Are My Friend contains 10 papers, 1 uppercase alpha set, and 48 elements including a dog, barn, and more! Perfect for a wide variety of layouts! And don't forget to pick up the Ewe Are My Friend Addon kit for more scrapping options! 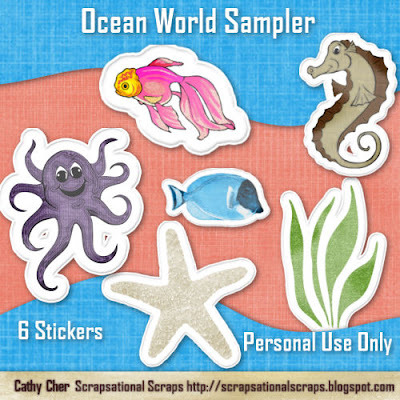 Under the Sea by Lynn is a fresh summertime kit and makes the perfect addition to your scrapping collection! Bright and bold backgrounds combined with elements including fish, shells, and more is perfect for scrapping all of your beach vacation memories! Be sure to stop by our New Kreations section of SDK to check out all of the new and wonderful kits available! The SDK design team has been hard at work creating tons of new kits for you to enjoy! Here is just a few of the great collections now available in the SKD shop! 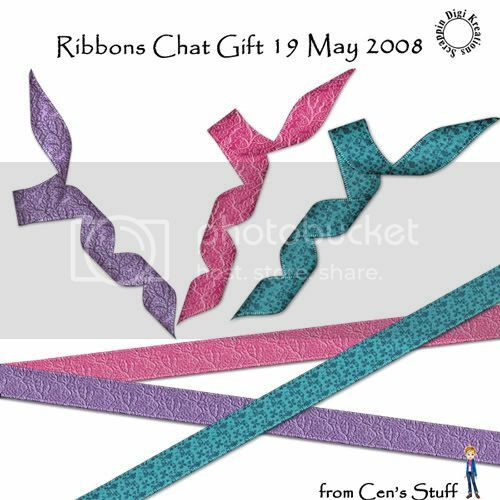 New designer Eirene has created this wonderful collection for your scrapping enjoyment! Forever Love is the perfect kit to showcase those love-filled moments with friends and family. The paper pack, element pack, and alpha/number pack can be purchased separately or you can purchase the complete kit at 25% off! Just click on the preview of your choice to be directed to that kit. Cathy Cher, another new member to the SDK family, has added this fun and pretty kit to her store! Spring Sachet contains 10 papers and 44 elements including butterflies, folliage vines, and more to help you scrap a whole season worth of great layouts! Be sure to check out all the great new designs in our New Kreations section at SDK!